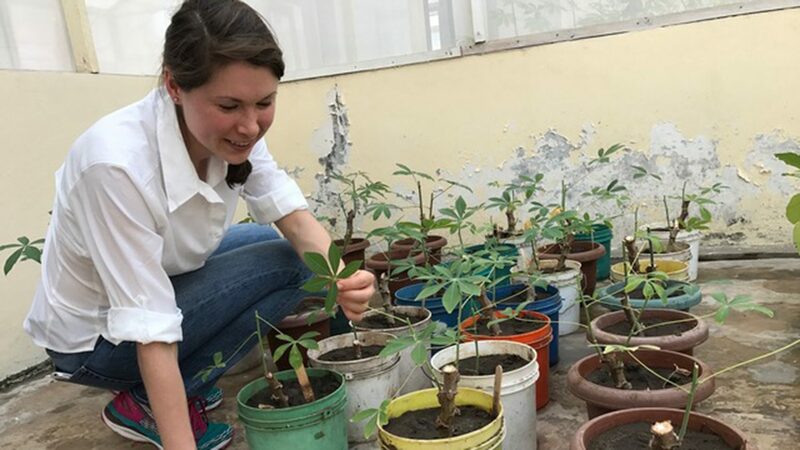 Editor’s Note: This is a guest post by Catherine Doyle, a graduate student in NC State’s Department of Plant and Microbial Biology. 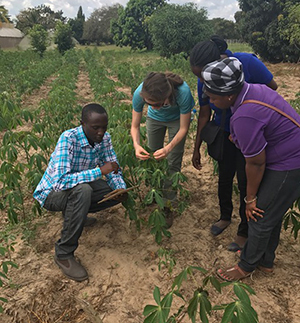 Doyle is spending several weeks in Tanzania, doing field work related to a research effort aimed at tackling a disease that threatens the livelihood of people throughout sub-Saharan Africa. You can read other posts related to her fieldwork here. 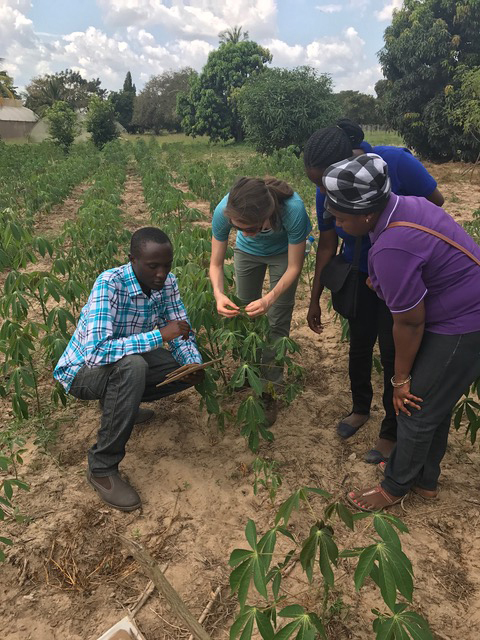 A team of four collecting leaf samples and scoring the cassava mosaic disease symptoms. Click to enlarge. My first week in Dar Es Saalam, Tanzania, has been an experience I will never forget. The week started with a visit from Tanzania’s Minister of Agriculture to Mikocheni Agriculture Research Institute (MARI), which delayed us from starting our trip to the field. He came to see the work MARI was doing after a CNN article came out about Joseph Ndunguru, the MARI project’s coordinator. As a national agriculture research institute, MARI is an important part of the international effort to tackle Cassava Mosaic Disease (CMD). Through surveying the hotspot regions of CMD, MARI is working with partners in seven countries to build a map of where CMD is spreading in East and West Africa. Using molecular biology techniques, MARI researchers also characterize the type of CMD found in the region. 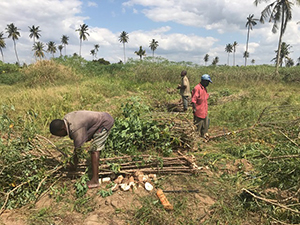 Workers harvesting cassava. Click to enlarge. My first few days here gave me the opportunity to talk to researchers, graduate and undergraduate students about their work on cassava and other crops, like cowpeas and pineapple. I really enjoyed talking to a graduate student named Makaranga about his work on improving local varieties of pineapple. His enthusiasm for improving the qualities of taste and biomass of native pineapple varieties was inspiring. I also got to work in the lab and help undergraduates learn how to extract DNA and RNA from plant samples. But my favorite part of the week came on July 13th, when we finally got into the field to practice the skills we’ll need to survey CMD. As we drove I was mesmerized by how the landscape and the cassava farms varied. Seeing different types of CMD infection in the field drove home the scope of the problem we are trying to address. I have seen infected cassava in the lab, but this was a moment of realization where I was able to connect the work I do in the lab to life in the field. It was unforgettable. In addition, I got see how cassava is harvested, and ate some raw cassava myself after collecting samples of cassava leaves and the whiteflies that transmit CMD. Tomorrow we leave for the southern part of Tanzania, where our survey will begin in earnest. 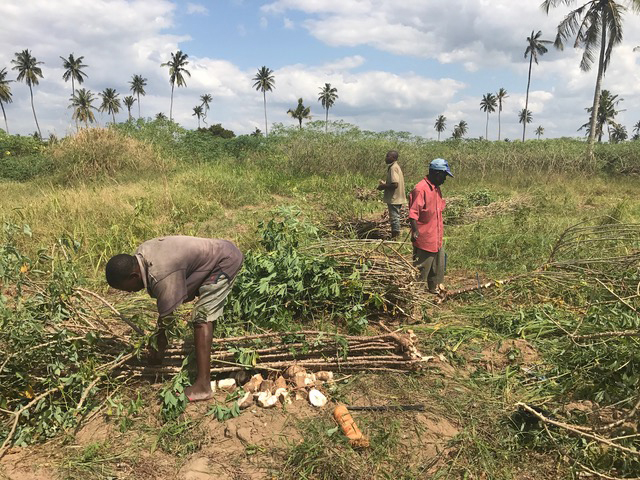 I am excited to learn more about cassava, to experience this beautiful country, and to hopefully move the research community one step closer to preserving and protecting the crops that so many in Tanzania and elsewhere rely on.